Andorra la Vella ([ənˈdorə ɫə ˈβeʎə], [anˈdɔra la ˈβeʎa], Spanish: Andorra la Vieja, French: Andorre-la-Vieille) is the capital of the Principality of Andorra. It is located high in the east Pyrenees, between France and Spain. It is also the name of the parish that surrounds the capital. 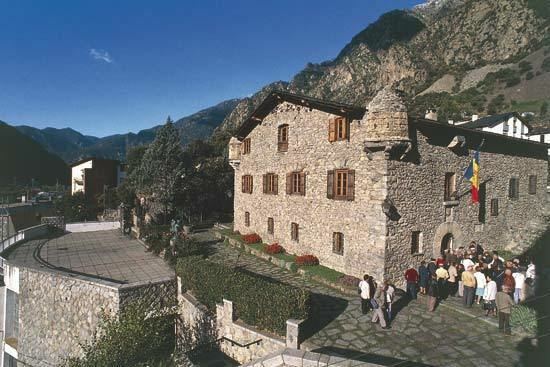 The settlement of Andorra la Vella has been the principal city of Andorra since 1278 when the French and the Episcopal co-princes agreed to joint suzerainty. 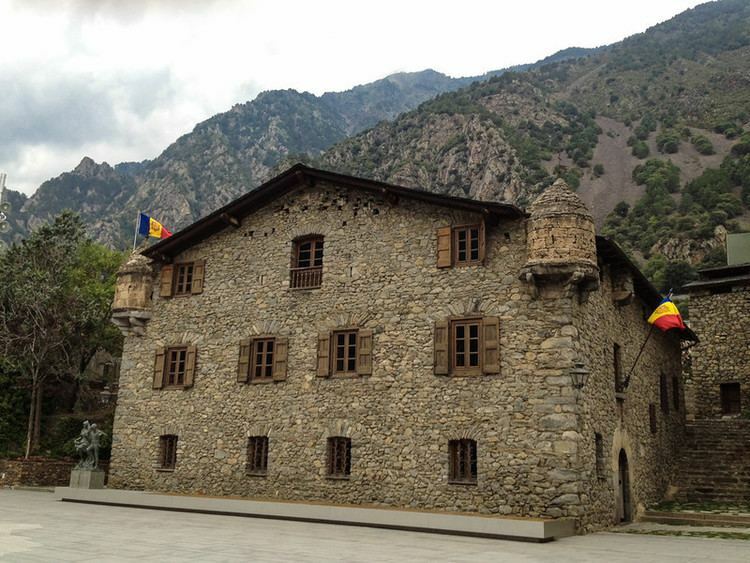 Andorra la Vella's old town—the Barri Antic—includes streets and buildings dating from this time. Its most notable building is the Casa de la Vall—constructed in the early sixteenth century—which has been the state's parliamentary house since 1702. 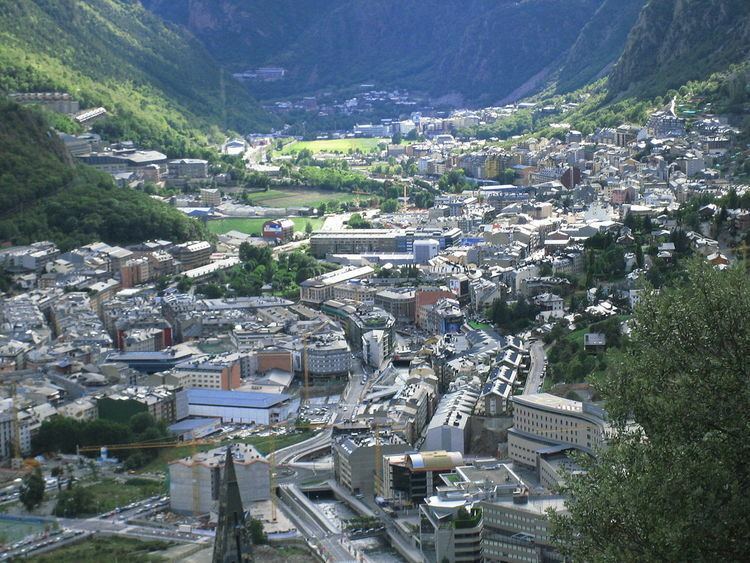 Andorra la Vella was, during this period, the capital of a largely isolated and feudal state, which retained its independence due to this principle of co-sovereignty. 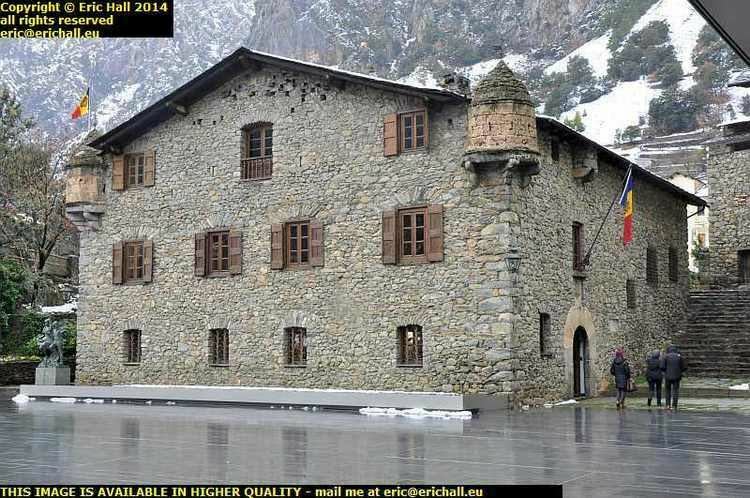 Well into the twentieth century, the area around Andorra la Vella remained largely forgotten; indeed the state was not part of the Treaty of Versailles, simply because it was not noticed. After political turmoil in the 1930s and an attempted coup by Boris Skossyreff, an informal democracy developed. During this period, Andorra also developed as a tax haven, resulting in the construction of modern banking offices in Andorra La Vella. The city also developed its skiing facilities, to the extent that Andorra la Vella was Andorra's applicant city for the XXI Olympic Winter Games, the 2010 Winter Olympics. However, Andorra la Vella was not selected by the IOC as a candidate city, following the evaluation report of an IOC commission. It also hosted both the 1991 and 2005 Games of the Small States of Europe. 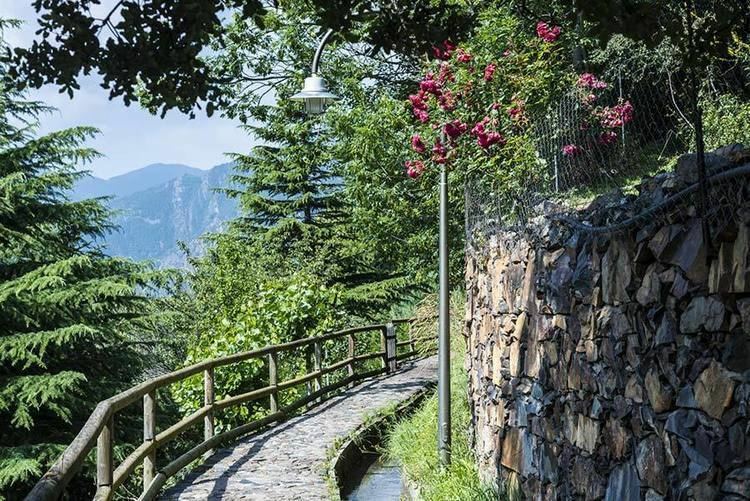 Andorra la Vella is located in the south west of Andorra, at 42°30′N 1°30′E, at the confluence of two mountain streams, the Valira del Nord (Northern Valira) and the Valira de l'Orient (Eastern Valira), which join to form the Gran Valira. It adjoins the urban area of Escaldes-Engordany. The city is at 1,023 metres (3,356 ft) above sea level. Andorra la Vella has an oceanic climate (Cfb, according to the Köppen climate classification), with mild summers and chilly to cold, snowy winters. The average annual precipitation is 812.3 mm (32 in). Temperatures are lowered by the altitude compared with lowland areas. Andorra la Vella has direct access to air transportation with commercial helicopter flights from Andorra la Vella Heliport, located in the city centre. Andorra–La Seu d'Urgell Airport is located 24 kilometres (15 miles) south of the city and since July 2015 operates domestic routes to various airports across Spain. Nearby airports located in Spain and France provide access to international flights with the nearest airports being Perpignan (156 km away) and Lleida (160 km away). The largest nearby airports are Toulouse (Tolosa), Girona and Barcelona. Andorra la Vella does not have a train station, although there are bus shuttle services linking the city to train stations at L'Hospitalet-près-l'Andorre (France) and Lleida in Spain. There are also shuttle buses from Barcelona, Girona and Reus' airports to Andorra la Vella. Native Andorrans, who are ethnically Catalan, account for only a third (33%) of the population, with the plurality being Spanish (43%) (both Spanish and Catalan-speaking), and notable minorities of Portuguese (11%) and French (7%). Catalan is the official language, although Spanish, Portuguese and French are also spoken. Most of the inhabitants are Roman Catholics, with a high life expectancy of over 80 years. The city's old town is characterized by old stone streets and houses. The central Església de Sant Esteve (Saint Stephen) church is part of the area that guidebooks often label as a picturesque part of the city. This was built in a Romanesque style in the eleventh century. As mentioned earlier, the old town also includes the country's historic parliament building. Probably the oldest building in the city is another church, dating from the ninth century, of Santa Coloma. The city is the country's cultural centre, with the Government Exhibition Hall acting as a main theatre and museum. The piazza outside the parliament building is also the location of a number of events, and the town hosts a music festival every winter. Andorra la Vella is the country's commercial centre. In the country as a whole, 80% of the GDP is derived from the 10 million tourists who visit annually. The city is also the centre for the many banks and businesses that thrive from its tax haven status. The state is not a member of the European Union, but has a customs arrangement with the EU, and uses the euro. The Instituto Español de Andorra (IEA), a Spanish international secondary school, is in La Margineda in Andorra la Vella. The Spanish primary school is Escuela Española de Andorra la Vella. The Andorran ski mountaineers Joan Vilana Díaz and Sophie Dusautoir Bertrand were born in Andorra la Vella.